Discuss how the strategies for energy and water conservation and resilience are deployed at the new Cornell Tech campus. Explain the principles of Passive House and outline its certification requirements. Describe some of the design and construction challenges faced by the team behind The House residential tower, slated to be the largest Passive House building in the world. On an island in New York, Cornell Tech opens a high-tech campus that marries education and entrepreneurship. This new institution, which offers graduate-level degrees in disciplines such as information science, electrical engineering, and connective media, and combines cutting-edge research and education with entrepreneurship, had, since 2012, been housed in Google’s building in Manhattan. But now its 300 students and 30 faculty members have a home of their own, with three completed structures: an academic building by Morphosis Architects; a “co-location” facility by Weiss/Manfredi Architects that provides space for collaboration between academia and industry; and a residential tower by Handel Architects. More students, faculty, and buildings are coming, including a Snøhetta-designed hotel and executive-education center set for completion in 2019, and the possibility of a total of 2.1 million square feet of facilities on the 12-acre site by 2037. Ultimately, there could be more than 2,000 students enrolled. Of course, having won the competition, they then faced the real challenge. The Cornell-Technion team had to tackle the hard work of developing a group of structures and a campus for a forward-looking curriculum that was not yet well defined, and one that would probably continue to evolve long after the first facilities were complete. The partners would need to grapple with other tough questions, such as what it means to build an urban campus on a two-mile-long narrow spit of land in the East River in an area that had once been home to a variety of institutions, including a penitentiary, an asylum, and a smallpox hospital. To make way for the campus, Goldwater Memorial Hospital, a late 1930s Modernist complex where chronic diseases were treated for more than 70 years, was razed. To shape the campus layout, Cornell Tech turned to Skidmore, Owings & Merrill (SOM). The firm’s master plan, which eschews the usual collegiate trappings of campus walls and gates, places a series of schematic volumes so that the buildings-to-come would define oblique view corridors of the Manhattan skyline and the Queens waterfront. A pedestrian route called Tech Walk threads through the site, helping to link the mostly residential neighborhood to the north of the site with Four Freedoms Park, the memorial to Franklin D. Roosevelt at the island’s southern tip, designed by Louis Kahn (RECORD, October 2012, page 125). The master plan also delineates open areas that permeate inward from the island’s perimeter to form what Karen Tamir, a principal with the project’s landscape architect, James Cor¬ner Field Operations, refers to as “scoops” of public space. These outdoor rooms keep a sizable chunk of the site open and accessible to nearby residents, the Cornell Tech community, and visitors. 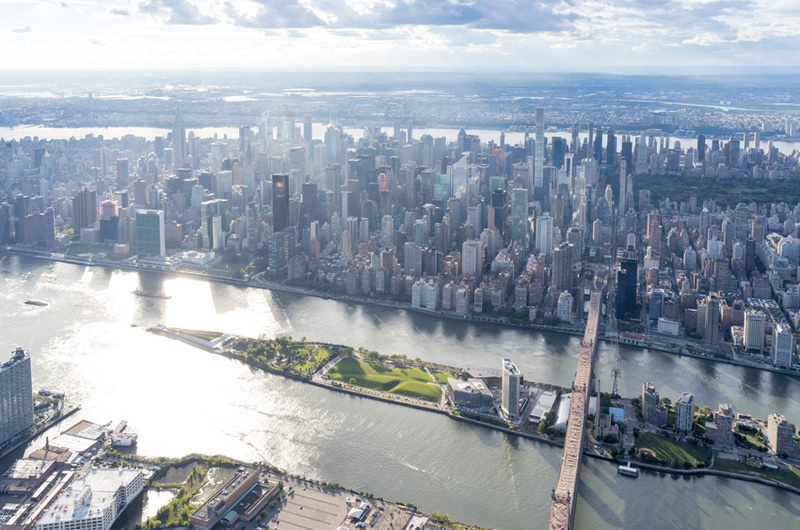 Together with the circula¬tion route, the amount of public space provided is considerably more than the 20 percent stipulated in Cornell Tech’s agreement with the city, according to Colin Koop, a design director for SOM. 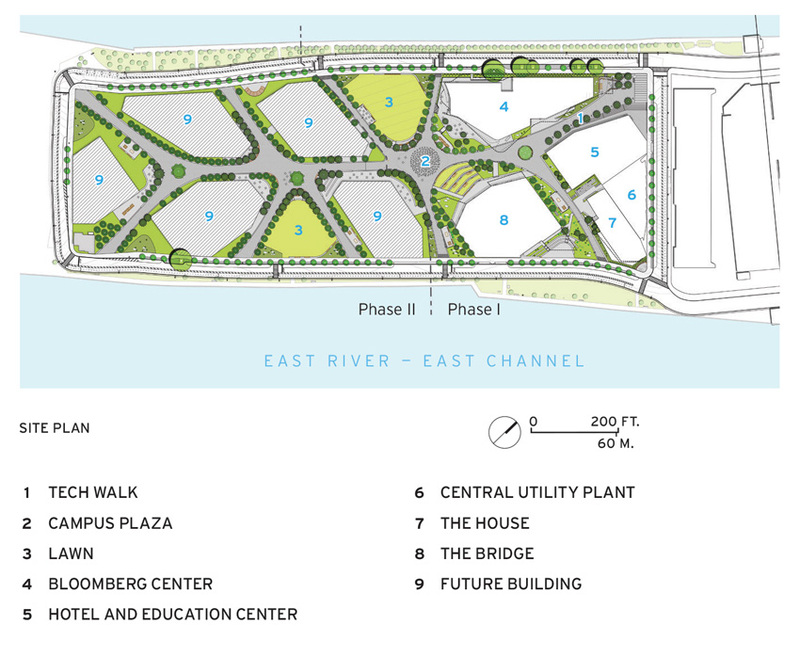 The campus plaza and Tech Walk (top right), between The Bridge (top right, shown at left) and Bloomberg Center (top right, shown at right), stem from a master plan by SOM for Cornell Tech’s Roosevelt Island complex. So far, only three buildings (top left and bottom) are complete. As further expression of Cornell Tech’s forward-looking values, it has incorporated crucial resilience and sustainability measures into its overall plan. Even before Hurricane Sandy hit New York in October 2012, the school decided to elevate all of the structures above the 500-year flood plane. To meet the building’s front doors, the Tech Walk slopes up significantly, but almost imperceptibly, from the island’s perimeter roadway. The individual buildings all have their own ambitious green goals, with the Bloomberg Center aiming for net zero energy, the co-location building on track for LEED Gold, and the residential tower slated to become the largest Passive House project in the world. It is too soon to know if these performance and certification targets will be met. But Cornell Tech’s success will also be measured by the answers to larger, and more philosophical, questions about the effectiveness of this unusual experiment in education, economic transformation, architecture, and urbanism. But with only a small portion of what is planned for the campus complete, it could take years or even decades to assess the full impact. At this point, the ensemble looks a bit like a potluck supper with a variety of dishes—some distinct, with exotic ingredients, some not. And they are clustered at the far end of the buffet table awaiting the rest of the meal.